Turn your photos into your own work of art - a stunning photo collage to liven up your home or as a special gift. Choose one of our wonderful designs with which you can easily turn your favourite photos into your own photo collage. A great gift to surprise a loved one or for yourself to brighten up your wall with all your best memories! You can create your own unique layout with our dynamic basic designs or you can opt for one of our several exclusive collage designs which have been created especially for EasyCollage by various talented designers. We offer a wide selection of photo collage designs for every taste and style. Check out our selection of designs and choose your favourite! A beautiful collage in five minutes? No problem! With EasyCollage, all you have to do is pick the design you like best and upload your photos. You can get started right away online: no need to download any application. 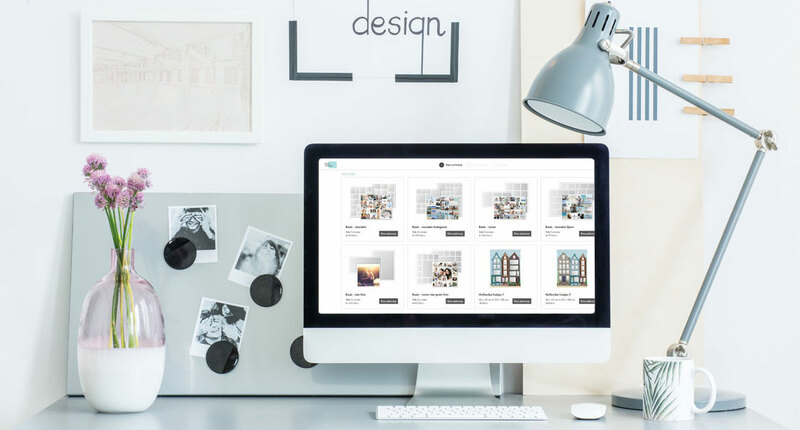 Just choose your favourite design on our website, upload your photos, edit them and order your very own unique photo collage. What kind of photo collage are you looking for? Help your shots look their best with a photo collage printed on unbeatable, premium quality poster paper. When you choose this kind of material, your photo collage is printed on luxury poster paper with a subtle satin finish. The extra thickness of the paper makes it ideal for framing and thanks to the wide range of colours and strong durability of the material, you'll have a museum-quality piece to hang on your wall and admire for years to come. With a photo collage on aluminium, your pictures are beautifully processed on three-layer aluminium with a subtle matte finish for a real eye-catching piece with a sleek look and feel. Thanks to the skills of our very best printers, the colours of your photos in your aluminium collage are truly brought to life. All aluminium photo collages are delivered with a free suspension system for easy hanging. With this type of photo collage, all your best images are printed on natural canvas made of 100% top quality cotton. This material lets us print your photos in very sharp detail, meaning your canvas collage is guaranteed to stay as beautiful as it was when it was first printed, even after many years. Each canvas collage comes with a choice of two frame thickness (4.5cm and 2cm) and a free suspension hook. 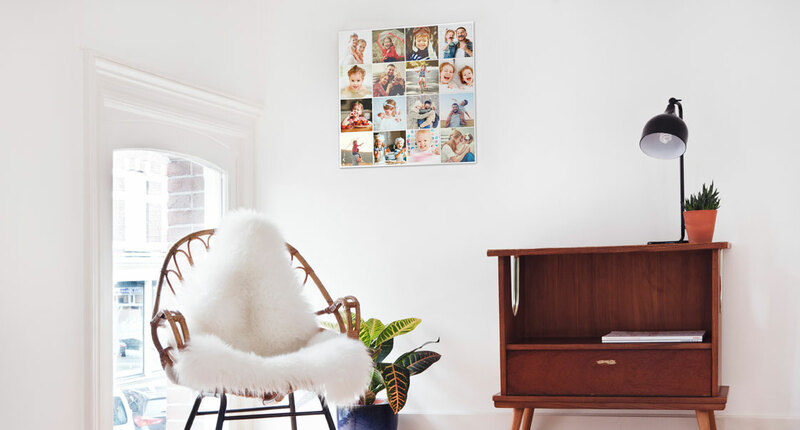 For the perfect finishing touch, choose a floating frame for your canvas photo collage. Choose a minimalist, polished look for all your favourite photos by placing them behind crystal clear acrylic. With this option, your photo collage is carefully printed on high-quality photo paper which is placed between acrylic and a solid alumina plate. We only use the best materials, tools and experts to create our photo collages, guaranteeing you stellar results every time. The protective acrylic layer in this type of collage means it will stay beautiful for years, while the free suspension system means you won't have a problem hanging it up.